pseudoparanormal: Is it in the blood,or in your mind? ESP: Is it in the blood, or is in just in your mind? Knowledge or perception without the use of any of the five senses. ESP includes clairvoyance (knowledge about some distant object or event, such as an unreported accident), telepathy (reading another's thoughts or sending one's own to another), and precognition (predicting the future). Although many people claim to have extrasensory powers, these powers have yet to be verified by scientific procedures. Concepts of ESP are that you are said to have a connection with another. That you can sense the energy from a subject, an object, a person, or simply through thought. There are several ways for this to occur. 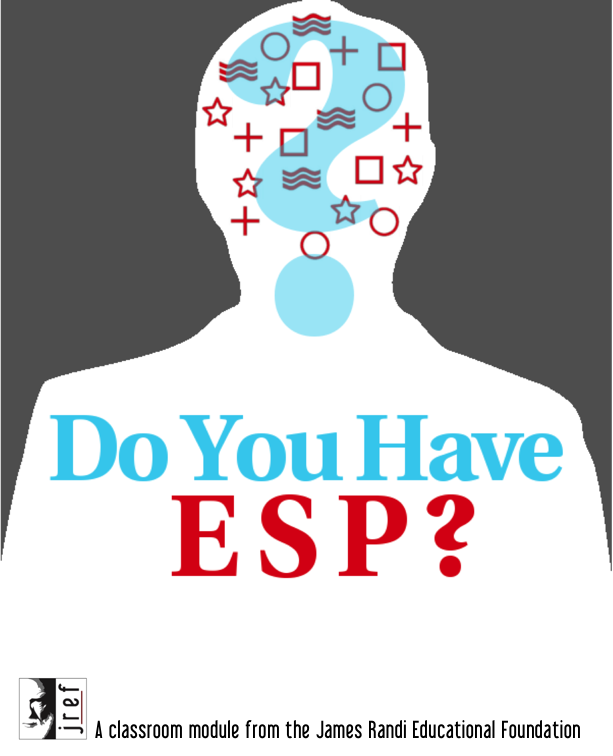 There are several tests that can be done to test your level of ESP. They used to use Zener cards and place them on a table and have the study subjects pick out the cards in sequence and match the energy to another subjects cards, There is dream hypnosis of ESP, there is telepathy, and psychics. This stirred up a conflict with many researchers and skeptics out there, that there in fact was no such thing as Extrasensory Perception and that it is all believed and not very well documented. For math maticians it is easier for them to count the cards or to make mathematical connections, or for those to have memorized a study or passed it along, or to be aware of a subjects answer before he/she gave them. Studies have shown that the best results of shown ESP however; we in a hypnotic or physically relaxed state of mind. This is when the body most relaxes and allows your mind to fully lose focus and become one with a situation, almost to lose control over your own thoughts and actions. Some people are so convinced that they have extrasensory perception. Many have come forward to say that they had saved lives because of it, or that they can call out the winning lottery numbers, or even call what the person sitting across from them is thinking. Is this a myth or is this the truth? In my experience: I understand this to a limit. Having siblings you may start to feel that you can develop or have developed a sense of ESP as well. I have had friends tell me that they can read my mind, know exactly what I am thinking or am going to say, or even what I am feeling. I have had days where my sister and I would pick out the same outfit to wear, or say the same sentence or phrase. I have also had says where I would scratch my head and my sister would too. Is it because it's in the blood or is it because we saw each other do it? one will never know. My Point of View is that Yes, you may have a sense of extrasensory perception, but we need to keep several concepts in mind when analyzing this information and the answers that have been given to us. If we had just been in a test or experiment and someone had given us answers to our lives which may just be mere guesses, we need to analyze these answers and think to ourselves two very important questions: Am i giving this person or subject any hints to the answer? and How many times were they/was I right about the situation, and how many times were they/was I wrong? Body language tells a person a lot. It can give a reader or people around you the in or clues and answers to your questions. You may not have to be a psychic to predict these answers they may be given to you if you just look hard enough. If you are given the right answer to your questions or someone is connecting on the same level as you are, if you feel you are feeling a connection and may be one with this person. Analyze the situation at hand. Think to yourself, I may be getting the right answers but how many of the answers that have been given to me are true. Was i given ten answers and only two were true. A persons mind is very strong and focuses on what he/she wants to focus on. The information may have been very vague and from that vague question, someone may have gotten an answer to your question by how you reacted when asked the question or in your response. It is easy to take a basic question and stretch it from there to feel a real ESP connection. We tend to focus very strongly and heavily on the things that are right rather then what is not there. For instance, you may have worn the same outfit as a sibling or friend on the same day, and maybe you thought you do have an extrasensory connection, but; sit back and wonder, how many times hve we not worn the same outfits compared to how many times we have. Is this real Extrasensory Perceptions, or are they simply our minds way of telling us that we pay too small of attention to the smaller things? i have acknoledge i have this extrasensory perception but it happens to me when i am doing something in a relax state of mind..